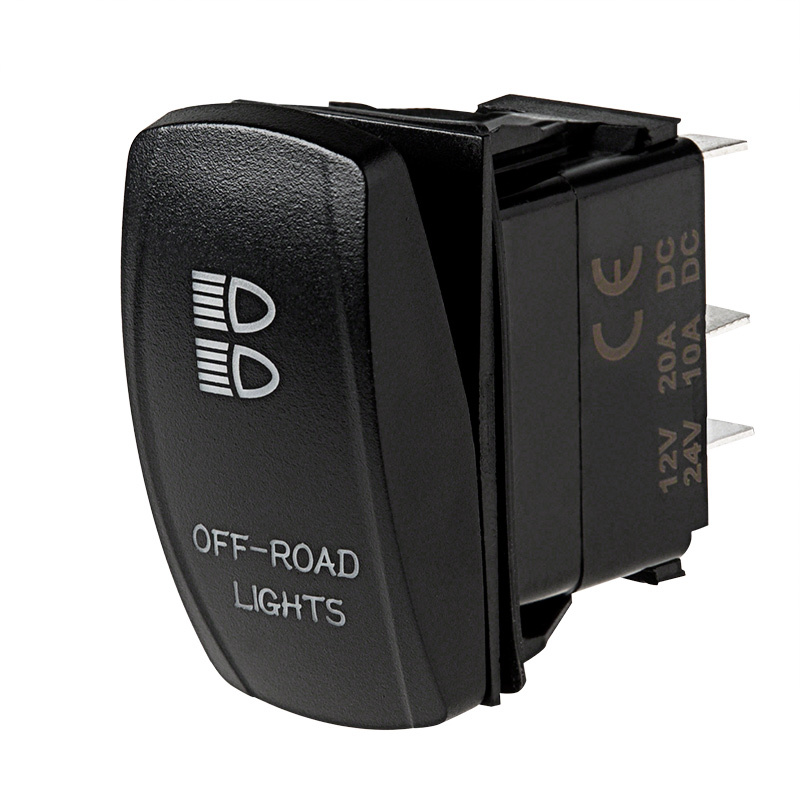 This single-pole single-throw (SPST) LED rocker switch lets you quickly control lights on your off-road vehicle, truck, ATV, UTV, boat, tractor, or machine. The illuminated switch has 2 independently controlled red, white, or blue LED indicators. Text is illuminated when the vehicle is on, and the legend is illuminated when the switch is pressed ON. 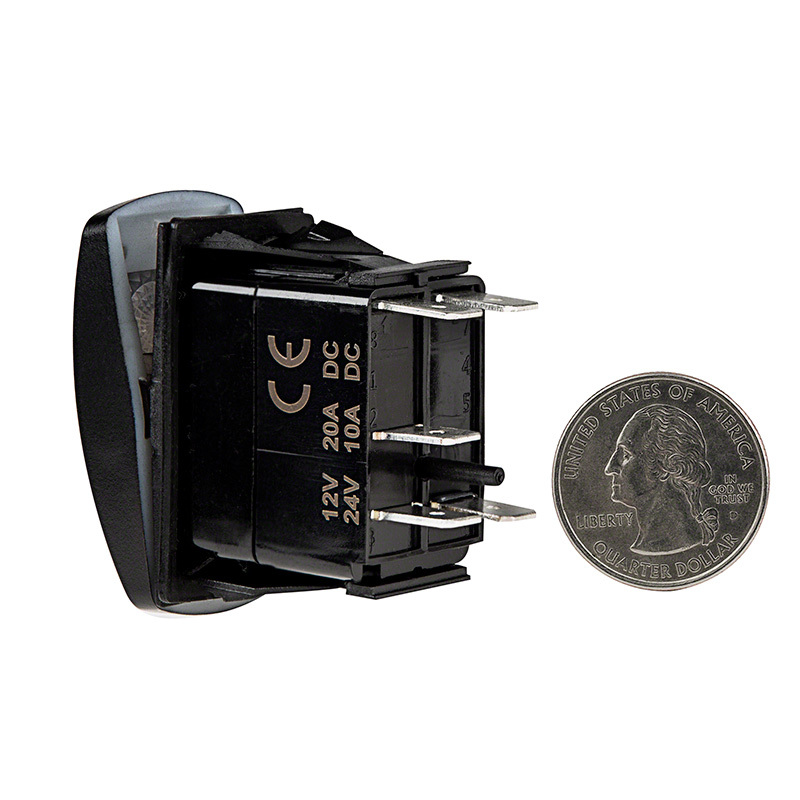 This 20-amp 12V on/off switch has (5) 1/4" male contact terminals to be used with 1/4" female push-on connectors. 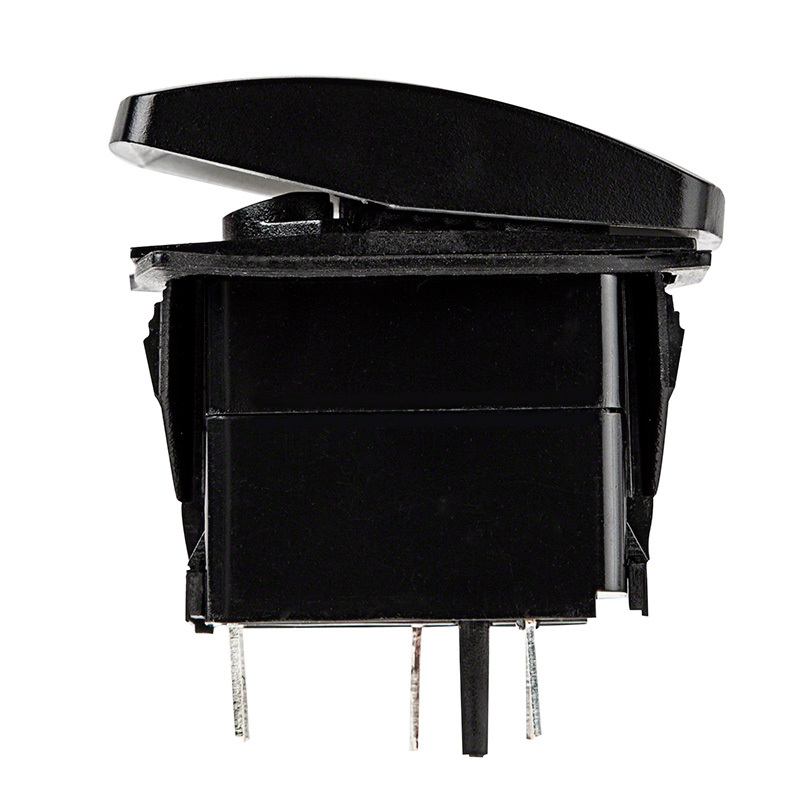 The sealed, watertight rocker switch easily installs in industry standard panel cutouts with the included rubber gasket (optimal panel thickness: 0.13" or 0.03" min. - 0.19" max.). 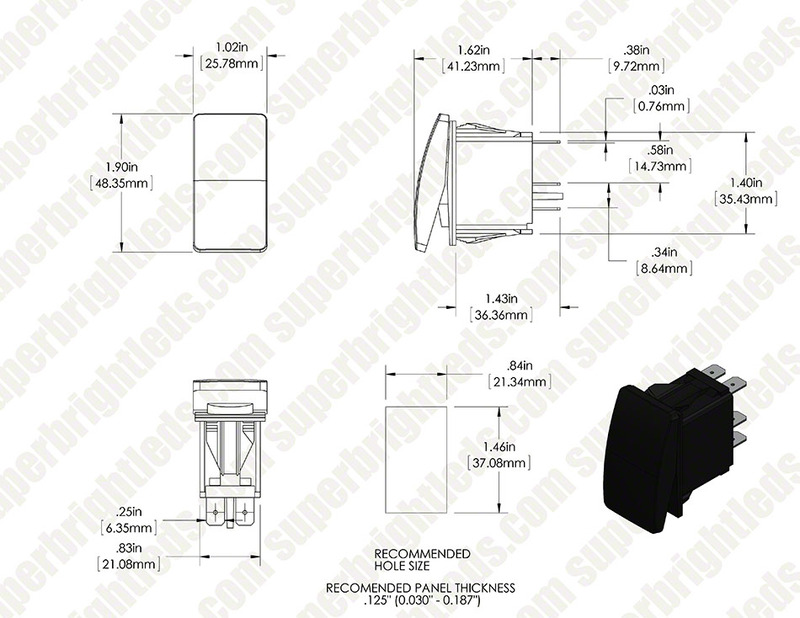 Modular switch brackets are available for single switch mounting in a 0.83" x 1.45" hole. 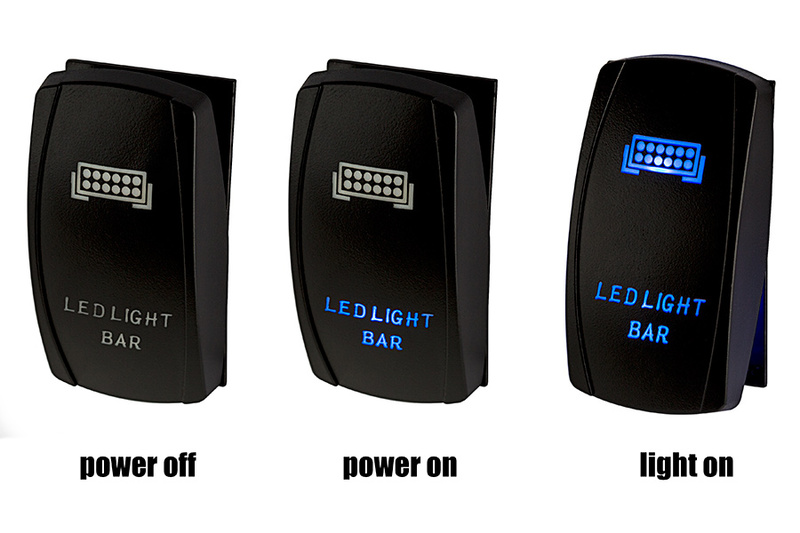 The dual USB rocker switch lets you charge your cell phone, tablet, iPod, or other device and is illuminated by blue LEDs when your vehicle is turned on. The USB charger operates within a wide 12-24V DC range with an output of 1 amp from the top port and 2.1 amps from the bottom port. 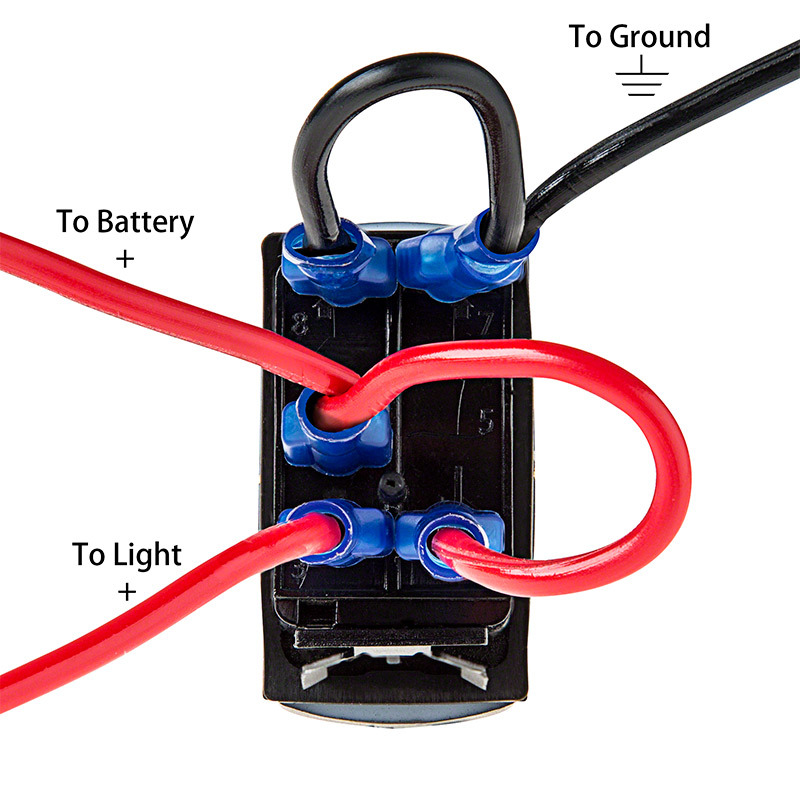 The charger has a total output of 3.1 amps at 5 volts and has (2) 1/4" male contact terminals to be used with 1/4" female push-on connectors. 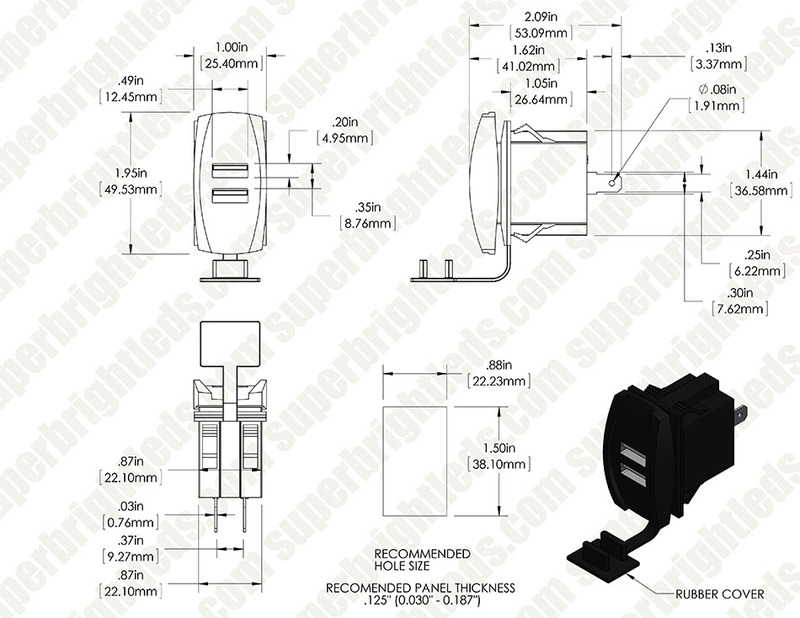 dash to accomadate switch dimensions. truck year 2015 Toyota tundra. 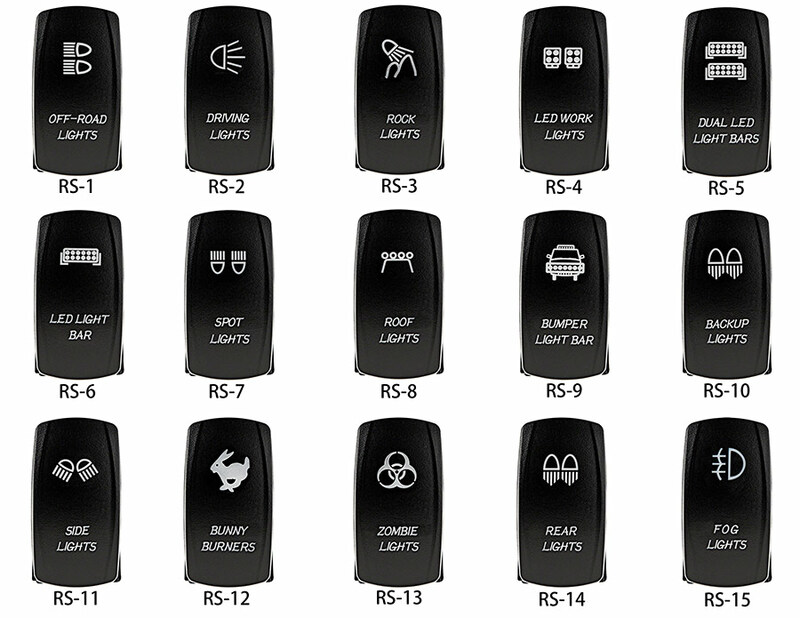 All my factory rocker switches in the Jeep are illuminated when the dash lights are on so I wanted my off road light to look similar. Already had day star rockers which only illuminated when in the on position. 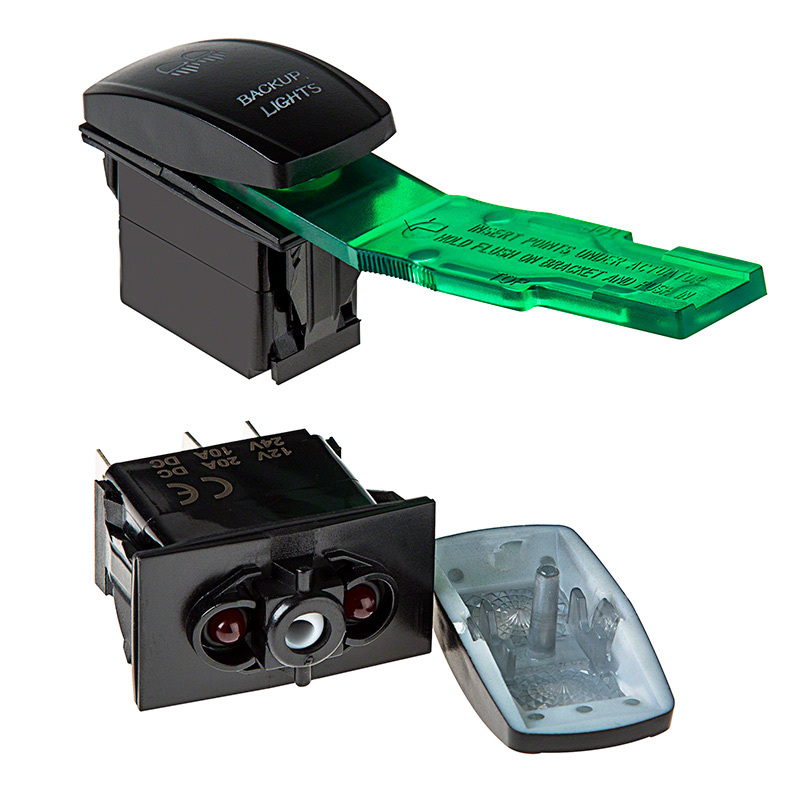 These have two lights, hence the name dual illumination, that light up the words when the dash lights are on and another light which lights up when the switch is activated. It took an hour or so to wire since the lights require slightly different connection points that the three prong day star type rocker switches. 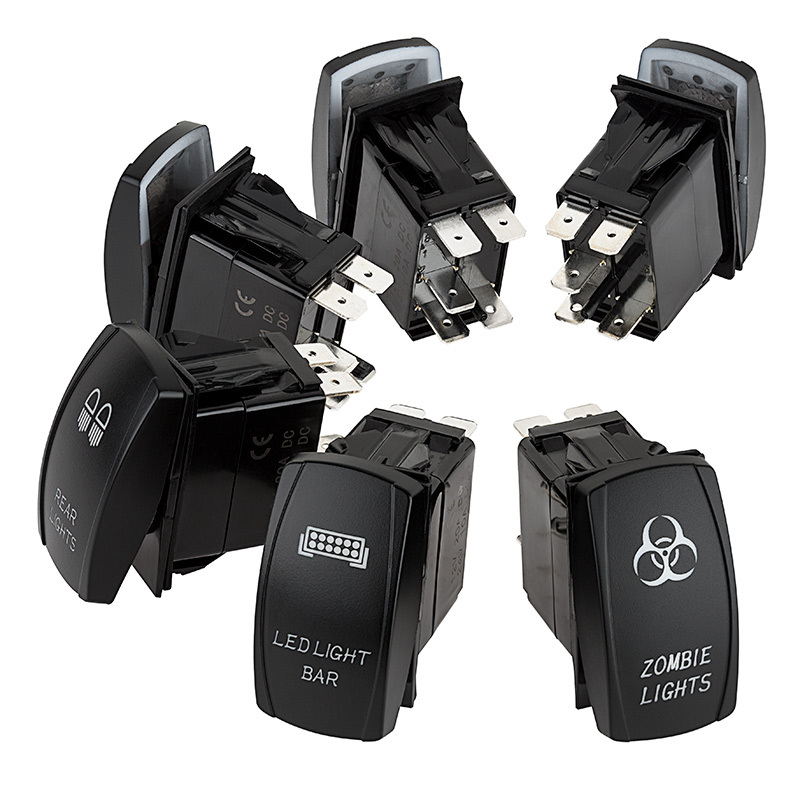 You can "jump" the negatives to each other and then just connect the "label light" to an accessory power source that comes on when the dash lights are on. I connected mine to my push lighter wire that only powers on when dash lights are on. Overall am satisfied with the switch and will be ordering two more today after I write this review. Great switch. I recommend you gather a few alligator clips and test your connections on the bench. The wording for the pin location is a little confusing. It would also be nice if you where given a dimension to cut the hole for the switch instead of removing little by little until it fits tight. Other than that it is a great switch. Not too bright when its illuminated so it doesn't draw your attention while operating equipment but plenty to locate the switch. It'll be the only illuminated rocker switch I buy for now on. Does what it is supposed to do. Would've given it 5 Stars if there was a Diagram or Schematic. I figured it out with my Multi Meter. I usually don't work with much in the 12VDC world. I added some LED work lights to my 60" zero-turn mower. 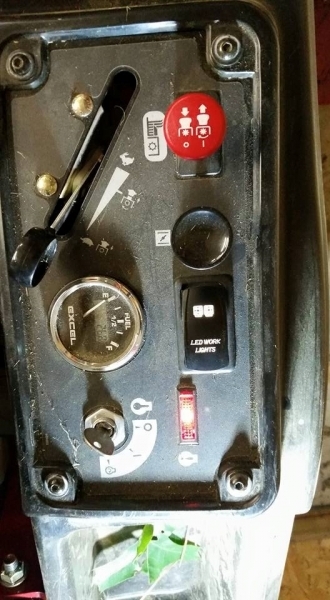 There was an existing cutout in mower's control panel that this switch dropped directly into. The wiring picture supplied by Super Bright LEDs was correct and the switch and backlights work perfect. Text is lit all the time and the work light picture is lit when in the on position. It looks really cool. I've only had it in use for about 10hrs, but it's handling the bumps from my 5 acres well so far.